The Netherlands has officially apologized to relatives of victims killed in Rawagede village during Indonesia’s struggle to keep its independence more than six decades ago. About 430 villagers were killed by the Dutch troops on Dec. 9, 1947. 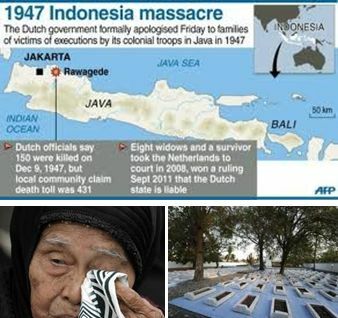 Dutch Ambassador to Indonesia Tjeerd de Zwaan presided over a tearful ceremony on Friday, attended by hundreds of villagers including surviving widows in their late 80s and early 90s, to issue an official apology from the Dutch state for its responsibility in the Rawagede Massacre. “Today, we remember your family members who died 64 years ago at the hands of the Dutch military troops. On behalf of Dutch government, I deeply apologize for the tragedy,” Ambassador de Zwaan is quoted as saying.